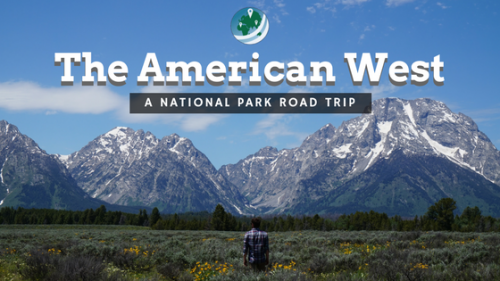 In light of President Trump beginning the process of pulling the US out of the Paris Climate Accords, we all need to shift our focus away from the national to our own personal contributions to climate change. 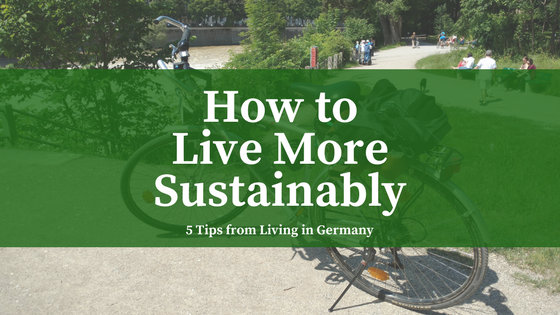 Since moving to Germany, I’ve picked up a few environmentally-conscious and typically-German habits that have taught me how to live more sustainably. I wanted to share the ways my lifestyle has changed that I think should become more common everywhere. Moving here was like a crash course in learning about our impacts on the environment and how to live more sustainably. It seems the ideas of reusing, recycling, and conserving are just built into the culture. As a result, a larger portion of the population is just more considerate of the effects they have on the world around them. Sure, our personal contributions are but tiny drops in the large bucket that is the global environment. But, when entire populations shift their behavior, that bucket begins to overflow very quickly. That’s the secret – we don’t need the big bad federal government (such as it is today) to tell us how to – or how to not – combat climate change. We understand that climate change is happening, we understand the causes and the effects, and we understand the possible consequences. The first German habit I’ve picked up is completely giving up having a car. In Germany, public transport is relatively cheap, easy to use, and ubiquitous. Additionally, cycling is much more attractive and common in German cities. Here, it’s not just a form of recreation but an important mode of transportation for commuters as well. Learning how to live more sustainably means getting out of our cars and onto the trains and the trails. Personal vehicles are one of the least efficient ways of getting around, in many ways. Depending on the weather, I’ll either bike the 4km (around 2.5 miles) to work, take the bus essentially door-to-door, or take the underground and walk a little bit (< 1km, about a half-mile actually). Unfortunately, the hot summer we’re currently having has made it difficult to bike to work without stumbling in like a hot mess. However, if I don’t rush, I’ve been able to arrive just a little warm, but not overheated, gross, or too sweaty. Biking around is one of the best ways to start living more sustainably. It is arguably one of the most efficient ways for humans to get around. Munich is a wonderful example of a city that actually supports cycling well, and really gets people out and about on two wheels instead of four. The city has built over 1,200 km of cycling paths, lanes, and trails throughout and around the city. A system of markings and signs clearly show where these cycling paths are, and where they go. It really is a pleasant way to get around for every kind of trip: for work, for shopping, and especially for recreation. 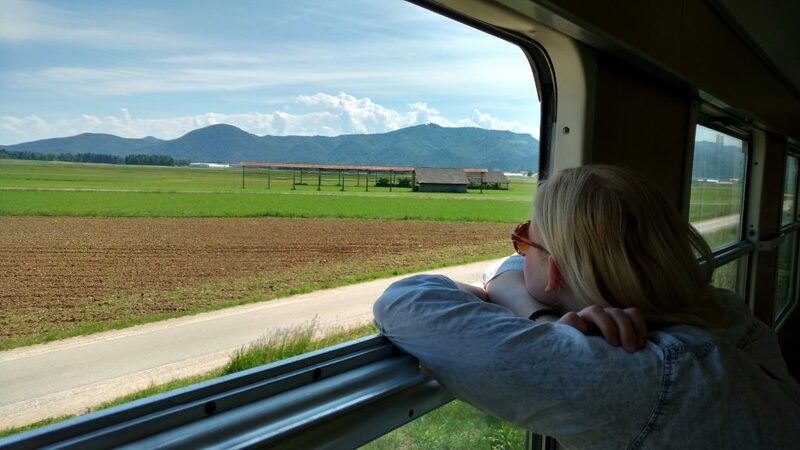 The last leg of the train journey from Munich to Ljubljana, cruising through the plains at the base of the Julian Alps. I realize that many of you reading this might not have the freedom of other viable transport options besides a personal car. This advice might seem a little pointless then, but at least you can see there are other ways that cities organize their transport system not centered around the car. Also, I’d encourage you to really look at your options for getting around without your car. At the very least, take the train (though they’re not very efficient in the US, still way better than a car) for your next vacation. Or, be like a German, and go on a cycling tour! 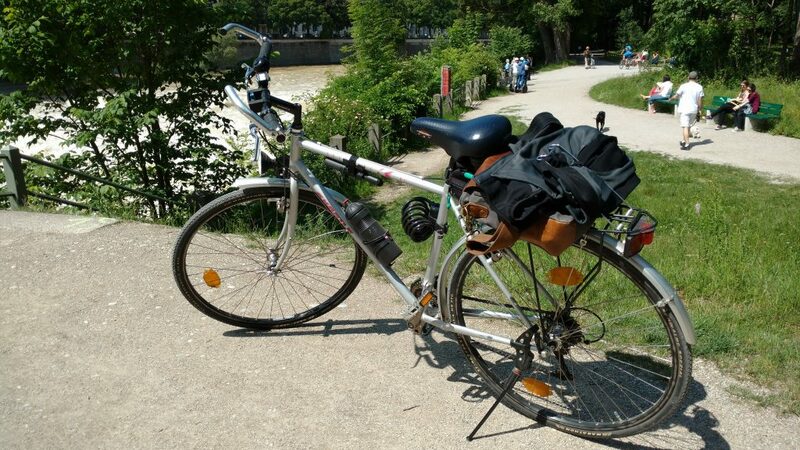 From cycling everywhere, let’s shift gears to my second German habit/tip for how to live more sustainably: recycling! So what do we recycle in Germany? Well, pretty much everything we can. In fact, it’d be easier to list the things we don’t recycle or compost. Tin foil, plastic wrap, unrecyclable packaging, various cleaning products, and other random junk. However, essentially all the packaging for regular groceries and general house supplies is recycled one way or another. As a result, our biodegradable compost bin and recyclables bins fill up much faster than our general garbage bin. 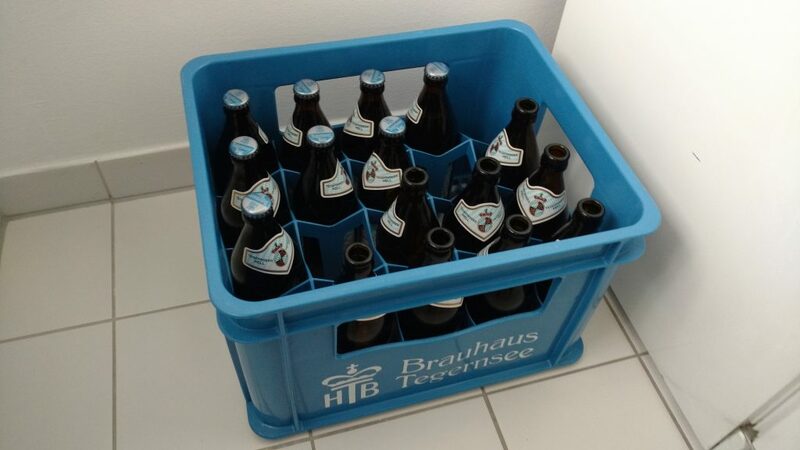 One of the most prominent examples of the prevalence of recycling in Germany is bottles. Large plastic water bottles, juice cartons, small drink bottles, wine bottles, and most importantly, beer bottles, are all recycled in one form or another. For most bottles, there is a Pfand (deposit) system that incentivizes people to return their empties to the store. For more on Pfand and Recycling in Germany, check out this older post. A Kisten of Bier! 20 half-liter bottles of a local brew will run you about 15-16 Euro. Pfand for the bottles and the case totals about 3 Euro. Recycling more and wasting less is a huge step in learning how to live more sustainably. Simply being conscious of what we buy and the packaging it comes in allows us to more purposefully buy less wasteful things. Plus, changing our purchasing habits is much easier than changing the way we get around like I suggested in the previous section. Look to reduce how much you throw out by buying in bulk or choosing items with packaging that can be recycled. And then, actually recycle it. When doing the dishes, plugging the kitchen sink and filling it with a bit of hot water to splash dishes in before scrubbing each item. Then, when the sink is full, turn the faucet on again (not too strong, of course) to rinse the dishes. This way, you end up using way less water than if you had just kept the faucet on for the duration. Same thing with the shower. Turning the shower off while soaping up before turning it back on to rinse off. Again, way less water than running the shower the whole time. Simply turning off the bathroom faucet while brushing your teeth. Why did anyone ever leave the faucet running while brushing their teeth?! Turning the lights off when walking out of a room. Just that simple. Keeping the refrigerator on a low setting – this used to annoy me at first, but now I’m okay with keeping the fridges at one notch above their lowest (meaning least cold) settings. Wearing more clothes in the winter instead of turning the heaters up higher. And conversely, since AC is pretty uncommon in residences in Germany, there’s no unit to keep at a higher temperature in the first place. There are probably a lot of other little things we can do to waste less water and energy, but that’s all I can think of for now. Frankly, it’s hard to make even little changes in our daily routines, so making these baby steps is definitely a good start. Germans are pretty conscious of the other ways the day-to-day running of their household affect the environment, too. A big part of a household’s usage of water and energy is doing laundry. So, making some simple changes to the way we do laundry could be another big step towards learning how to live more sustainably. We wash our clothes at lower temperatures and with shorter, less intense cycles. This not only uses less energy but it does less damage to our clothes as well. Just have to be careful with more sensitive fabrics that require specific wash cycles, like wools and some synthetics. However, there is no worry of damaging clothing in the dryer, because we have no dryer. Like ACs, driers are also pretty uncommon in Germany, though I think they are catching on a bit. 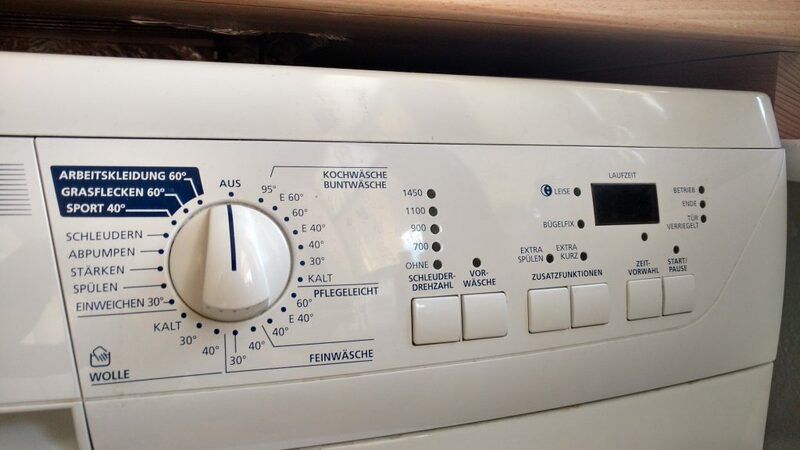 The wonderful complexities of our very German washing machine. It took some getting used to, but now I’m used to the idea of doing laundry without a dryer. One big adjustment was getting used to the idea that there’s no quick load of laundry here. You just have to wait for things to hang dry. Fortunately, we have two balconies with ample space for drying racks. Unfortunately, that means one is almost always occupied by a drying rack. When it comes to household chores though, it’s not just about saving energy and water where we can, but also using the right products to clean up the house. For example, we’re starting to use vinegar and lemon to clean much of our home, only resorting to traditional cleaning products for tougher or more specific jobs. Also, we use rags instead of paper towels. I was a big paper towel offender back in the States so it’s been a conscious decision to use less. Lastly, but not least-ly… food. My eating habits have certainly changed since moving to Germany. One of the major parts of learning how to live more sustainably is learning how to eat sustainably. That has meant a couple of things. First, eating less meat, especially beef. Luckily, it’s just not as common, and not as good, here in Germany. Overall, I’d say we eat beef probably about once a month. 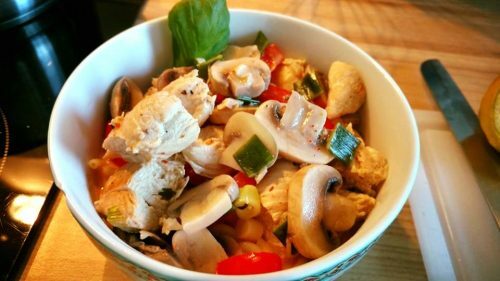 If we do include a meat in our dinners, it’s most likely chicken, if not, then some form of fish or pork. Other than meat, we do eat lots of dinners featuring lots of vegetables like eggplant or zucchini along with starches like pasta or potatoes. While this sweet and spicy soup does have meat, it as well as most of the veggies are from the region. Plus it was delicious. This was a great veg dinner we made recently and thoroughly enjoyed. 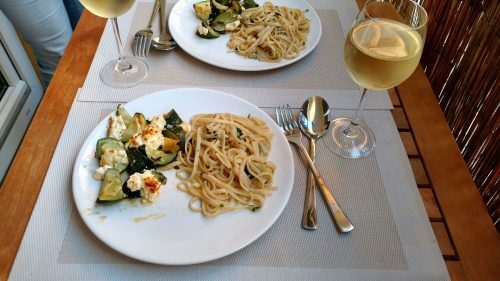 Some basic linguine with olive oil and garlic, served with baked zucchini and ricotta cheese. Another part of eating more sustainably is eating local. I’ve picked up this habit purely by picking the right items at the store. Labeling food as somehow local is somewhat of a trend in German supermarkets, at least the ones I’ve been to. We buy milk, eggs, meat, cheese, yogurt, and some common vegetables from local Bavarian producers. It’s not like we go to some expensive co-op either, all these items are easily and cheaply available at all the main supermarket chains. Our little balcony herb garden, fresh, free, and fantastic basil, rosemary, parsley, and cilantro, whenever we want! 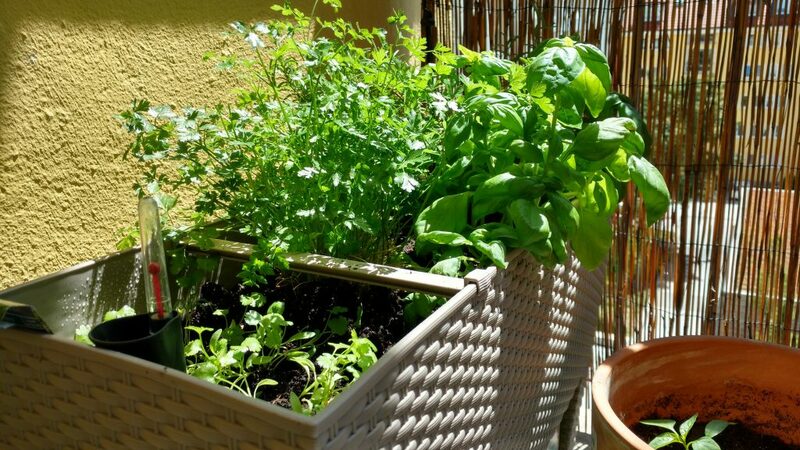 As a small final note – we also grow our own herbs in our little balcony garden. By growing our own plants, we prevent the environmental impacts of processing, packaging, and transporting the little packages of fresh herbs we’d normally have to buy. I’m sure these impacts aren’t as significant as not eating meat, but they’re something. The real effect this has on us directly is on our wallets, and on the quality of our food. Instead of buying 2€ bunches of fresh herbs near every time we want them, we just pick off however much we need. And finally, undeniably, our fresh-picked herbs taste so much better than the somewhat stale packets from the supermarket. Hi there! As a German, it was super interesting to see how foreigners feel about our sustainability practices. It’s funny, most of these have just always been there since I was little, so I don’t even consciously think about it anymore. Kudos to you for adopting these changes, some habits must have been quite hard to shake! I’m happy another German agrees with my idea that most of these things, and many more, are woven into the fabric of the society now. That made it so much easier to pick up the habits, since there is a sort of social pressure to live life in a more sustainable way. Thanks for commenting! 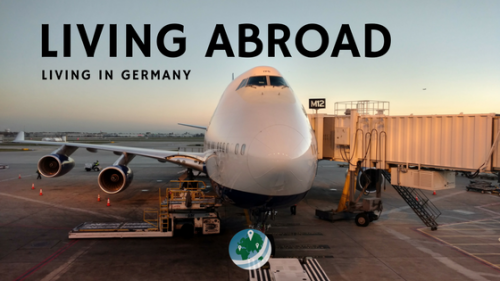 I spent a year working in Germany after I left school (years ago!!) and noticed many of the things you point out here – and then when I came to live in London, I noticed their absence! I used to cycle all around Hamburg using the cycle lanes, which are so safe because they separated from the road by grass. London is way behind in that respect and although they are finally catching on to cycle lanes, they are part of the road and so not always very safe. I hadn’t thought of noticing their absence, but I definitely did when I went back to the US for Christmas and New Years this past holiday season. I don’t think I even attempted to bike then (it was winter…) but Chicago has also done some catching up on bike lanes throughout the city. Some lanes are simply parallel to the street, like you said, but others are separated from the street traffic by plastic bollards and painted green to clearly indicate the lane. Those properly separated and marked lanes are used muuuuuch more than the typical lanes (they were designated as the highest traffic bike lanes for their “directions” too, N-S and E-W, and others). But yea, still, the modal share of bike trips in Chicago – currently rated as the best of one of the best cities in the USA to bike in – is paltry compared to the 17% of ALL trips here in Munich. 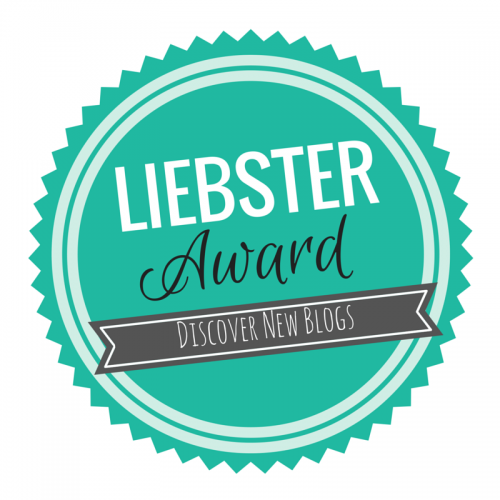 Very good tips… some i hadnt ever thought about! Although i do notice a big difference is sustainability between the UK and other European countries… I was blown away by how “green” Slovenia was! It is crazy how much we don’t think about how just living our lives “normally” affects the environment around us until we actually think about it! 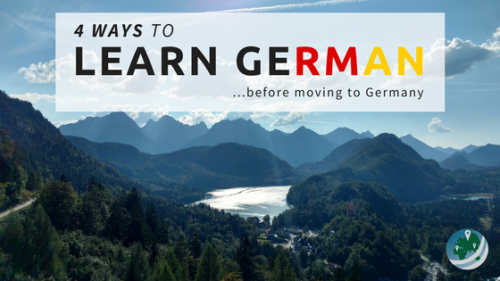 In my case, this was expedited by moving to Germany, but I’m trying to spread what I’ve learned to others, as well as show how living in another culture can really change your perspective on lots of things 🙂 Thanks for commenting!